I don’t like to use inflammatory language, such as the title of this article, but the message from the mainstream media about gold demand is a lie misleading. Yes, coin purchases in North America are down compared to last year (a record-setting year, by the way). It’s been soft at a few other Mints as well, such as Perth. But Eagle and Kangaroo purchases aren’t the whole market. You and I don’t buy paper gold products, for example, but throw in demand from this part of the industry and a very different picture emerges from the dour headlines you see from gold haters mainstream sources. Let’s face it, some investors are going to opt for paper gold—so if we want an accurate picture of gold demand we have to include all sources. I know this seems obvious, but sometimes journalists favor headlines that support their biases are sensational. Add up all the gold exchange-traded products (ETPs) around the world and you’ll find that the first half of the year has been a knockout. Global ETPs (which includes ETFs like GLD) saw inflows of $245 billion in the first six months of 2017, a new and lofty record. This is a LOT more than the first half of last year. Or most years. Look how it compares to the average level of demand over the past decade. Keep in mind that as the chart shows, we haven’t got to what is typically the strongest part of the year. Here’s another way to look at just how robust current demand is for gold ETPs. This chart compares the first half of 2017 to ALL of 2016. What’s especially impressive is that $245 billion would be the second-largest FULL year amount on record. If the current pace continues, ETP inflows could reach a whopping $500 billion by year end. 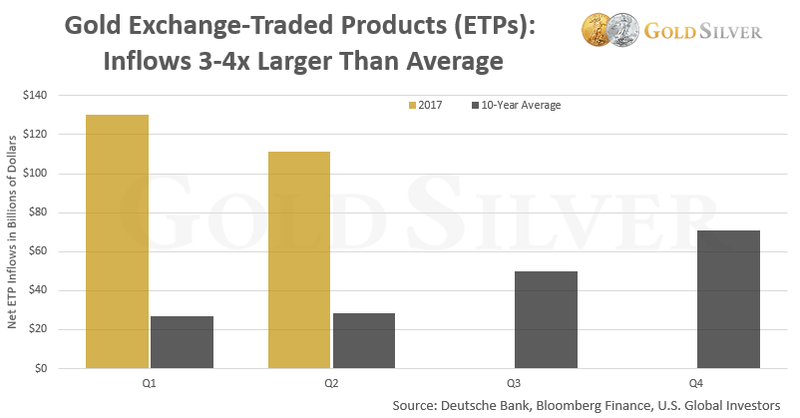 This clearly signals that institutional investors—the primary buyers of gold ETPs—see a crucial need to have exposure to gold. It’s pretty straightforward: total global silver ETF holdings reached yet another record level last month. There simply has been no letup in investors buying silver ETFs. This is not the behavior you would see if investors didn’t think there was strong potential in silver. Holdings in gold ETFs based in Europe just reached a new record level. 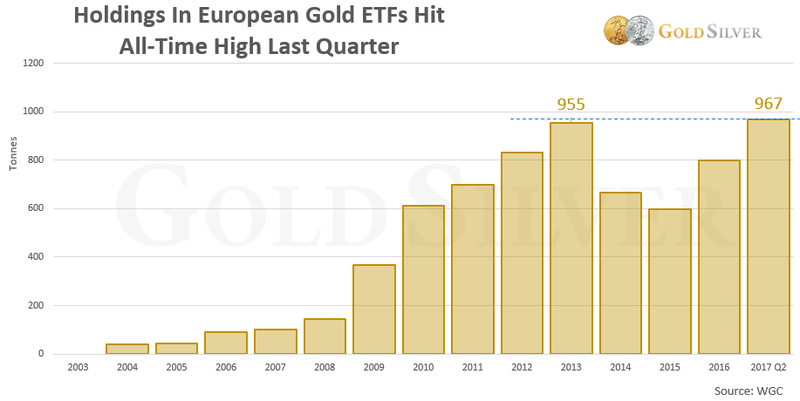 Demand for gold is so strong in Europe that these ETFs represented 76% of all net global inflows in the second quarter. It’s rather obvious that European investors see an ever-growing need to have exposure to gold right now. Chinese gold ETFs saw net outflows in the first half of 2017, but coin and bar demand was up a remarkable 56% over last year. Total gold consumption grew almost 10%, and physical withdrawals from the Shanghai Gold Exchange in July were the 3rd highest ever for that month. The Association estimates that demand for the year may exceed 1,000 tonnes, which would be the highest level in four years. Gold production in the country, by the way, is down 6% so far, similar to what is happening almost everywhere. As for silver, customs data shows that 1,984 tonnes were imported in the first half of the year, 37% more than last year. It was also the highest level of imports for the first six months since 2010. Most headlines I see about China reference lower demand, but that is clearly not the full picture. Gold demand in India was up 26%, the third consecutive quarter of higher volumes. And imports in July more than doubled. Retail investment in Turkey has surged, hitting its highest level since 2013. Gold demand was flat in Vietnam, but the government just introduced a measure to remove much of the red tape surrounding gold bars. As such, state banks will soon be able to import gold bullion directly, which will likely lead to a spike in demand. There is no letup in interest for gold in these countries. And don’t look now, but the US Mint just reported that silver coin sales were up big last month, from 986,000 Eagles sold in June to 2.27 million in July, a jump of 130%. Overall sales are still subdued for gold, after 2016’s banner year, but silver sales last month were actually 65.7% higher than July 2016. Meanwhile, UK dealer BullionVault reported an interesting anecdote about demand in early July: it said its record gold holdings are now so high that they could make more than 10 million 18-carat wedding rings, or supply the microchips for 1.5 billion iPhones. Which Message Do You Listen To? If an investor gages the status of the gold market by popular headlines, they might come to the wrong conclusion. And take the wrong action. They might assume interest in gold is on the decline, or that the price may fall, or maybe even sell their holdings. 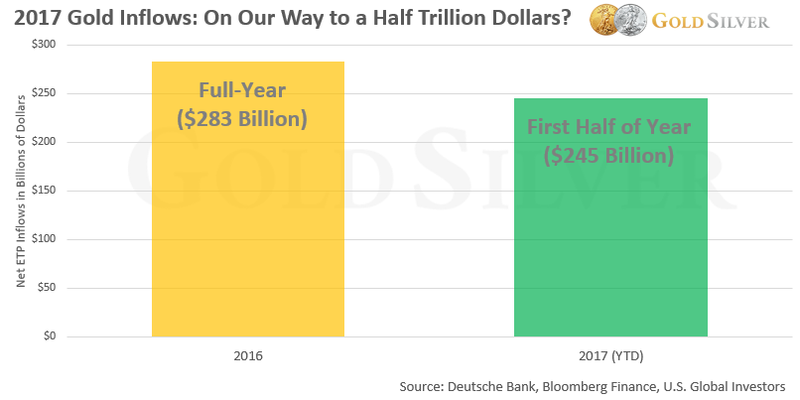 But if global gold demand is actually much stronger than what is generally reported, the opposite conclusions are drawn: more people than ever want to hold gold right now, and the price will ultimately head higher once the fears those investors have begin to play out. And they’d take the opposite action: continue to denominate their savings in physical metal. Based on a look at the total gold market, the latter message is clearly more accurate. As such, I encourage you to do what we’re doing: accumulate gold coins and gold bars, while prices are subdued, premiums are low, and supply is plentiful. Someday, every one of those factors will be just the opposite—higher metals prices, expensive premiums, and sporadic availability. Regardless of mainstream headlines, don’t lie to yourself about how much gold you’ll need or what’s ahead for the precious metals market.